The Tivoli complex, with its Italianate architecture and five-story central building topped by a two-story tower, has been a Denver landmark since 1891. The 12-building complex housed one of the city’s earliest breweries and the Turnhalle Opera House. Today, the thoroughly renovated building serves as the Tivoli Student Union for the Community College of Denver, Metropolitan State College of Denver and University of Colorado Denver, which share the Auraria higher education complex. The Tivoli site on 10th Street between Larimer and Market streets got its start in the beer business in 1866 as the home of Sigi’s Brewery, which was opened by German-born Moritz Sigi to serve the booming new town of Denver. A block away, at 11th and Larimer streets, was John Good’s Rocky Mountain Brewery, founded in 1859. 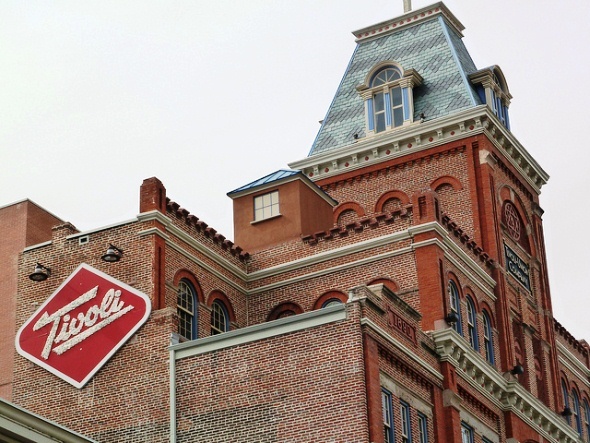 Sigi changed the name of his company to the Colorado Brewery in 1870 and began the construction of the buildings that make up today’s Tivoli complex. But Sigi was killed at the age of 47 when frightened horses caused his coach to overturn in 1875. In 1879, Max Melshimer borrowed $250,000 from Good, who had sold his brewery, and used the money to buy the Colorado Brewery. Melshimer changed the company’s name to the Milwaukee Brewery and began expanding the operation, adding the Turnhalle Opera House at the southeast corner in 1882 and the mansard-roofed tower at the center of the complex in 1891. In 1901, Good merged Tivoli with the Union Brewery, forming the Tivoli-Union Brewery. The company was one of the few Colorado brewers able to survive prohibition, thanks to a cereal beer called Dash. After prohibition ended, the business continued to expand as Denver grew, and it was producing 150,000 barrels of beer a year and shipping its beer to states from California to Texas by 1950s. In 1965, Tivoli-Union was sold to brothers Carl and Joseph Occhiatio, who introduced Denver Beer in cans and packages featuring the city’s skyline and snow-capped peaks beyond. But the Occhiatios ran into trouble as the Platte River flooded the area in 1965 and then brewery workers went on strike over wages in 1966. The strike lasted six weeks, and Tivoli-Union lost half its accounts. The company never recovered and closed in 1969. In 1973, the rundown Tivoli complex was placed on the National Register of Historic Places, protecting the historic buildings and brewing equipment. That same year, the Denver Urban Renewal Authority bought Tivoli with the help of federal funds and transferred the building to the new Auraria Higher Education Center. The Auraria administration leased the Tivoli complex in 1979 to a private developer who restored the buildings at a cost of $27 million for a retail center. The two-story copper kettles that held Milwaukee beer and Tivoli beer were focal points of a restaurant, and the old buildings were tied together by a new plaza under a three-story atrium. In 1991, Auraria students voted to buy back the lease and turn Tivoli into a student union and retail center, using bond funds. The colleges took over the building in 1992 and closed Tivoli for renovations. It reopened in 1994 as the Tivoli Student Union, with shops, restaurants, a food court, and conference and meeting space that includes the opera house. Another renovation project, for $28 million, included the removal of white paint that had covered the red bricks on the buildings since 1935. The project was completed in 2005.